With a slightly deeper body than the Cordoba 55FCE, yet thinner than a standard Spanish guitar, the Cordoba GK Studio acoustic-electric guitar is an extremely comfortable nylon-string guitar for any player. The tone is bright and snappy, the action is low across the fretboard, and the neck is slightly narrowed. A Fishman pickup system gives the Cordoba GK Studio Guitar a clear and natural tone when amplified. The acoustic guitar starts with a solid European spruce top. The back and sides are cypress”a very traditional tonewood, yielding rich, full tone with a creamy dark color. 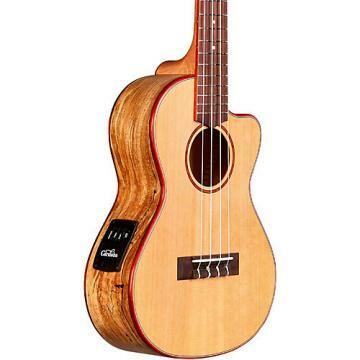 The fingerboard, bridge, and binding are rosewood, offering quick response and lasting sustain. The wooden rosette is hand-inlaid, the tuning machines are gold, and the finish is a natural lacquer, for a package that is nothing short of spectacular. The Cordoba guitar's Fishman Presys Blend electronics with onboard digital tuner offer clear and powerful amplification for intimate settings or center stage performance. In summary, with Cordoba's current crap-shoot Chinese build quality, I'd definitely recommend a store with a solid return policy. The GK Studio just doesn't cut the mustard in terms of build quality, overall tone, and cannot stand with similarly priced flamencos. If you want a great flamenco guitar look elsewhere. If you want a classical, you're looking at the wrong guitars (people often confuse the two). The features on the this guitar are fairly good. Built in pick-up and onboard tuner are a nice touch. If this had a goose-neck pick-up I'd say it would be a 7.0 on a 10 scale for features. The cut-away design is a nice bonus, but I personally don't require it. Solid spruce top is good too, but not anything to write home about since others in this price range have solid tops as well. The neck is thinner than other flamenco guitars and is easy to navigate, but the frets are a slight disaster, as I'll explain in the Quality section. Quality is so-so. I have owned other Spanish-made Cordoba flamenco guitars in the past and I truly believe the build quality has suffered on these Chinese-made models. I'd doubt the guitar would be able to sustain 4-5 years of percussive flamenco guitar playing. The guitar is nice and light, much in the spirit of a flamenco guitar. But the guitar sounds small and anemic. I shouldn't be surprised due to the small body. I owned my GK Studio for about a week so as to not be hasty on my opinions, but I cannot get past the fact that this guitar, and several other GK Studios I have played at various music stores after I got mine, just can't deliver the overall tone I am looking for. There was a music store with two GK Studios on hand, one was set-up by a guitar tech, the other was just hanging on the wall. The one that was set-up by the guitar tech definitely sounded better, but still lacked the overall attack and tone I desired in a flamenco. Playability is merely okay. When I slide down the neck I can feel the jagged edges of the frets. Also, my guitar had severe fret buzz. Keep in mind, flamenco guitars tend to have a tiny amount of buzz, but the notes should still ring clearly (hard to explain to people that haven't played a flamenco guitar). Not so on this guitar. Big fret buzz at several points on the neck, and almost a few dead notes at certain frets on the high E. I was able to adjust the neck a bit from the truss rod to remedy some of this. I would have to pay extra money to get it corrected, which made me return this guitar for something a bit more expensive, but hand made: A Francisco Navarro Student Flamenco guitar. Again, look elsewhere. 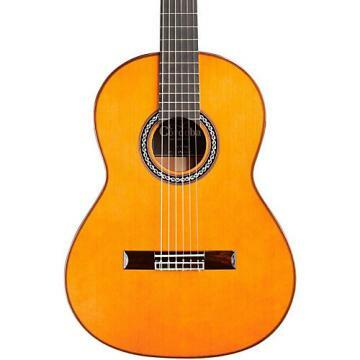 The Manuel Rodriguez C3 Flamenco, also available on Custom Guitars Friend, is a superior guitar at a cheaper price. You may have to adjust the bridge to lower the strings, but the tone is superior from what I have played. Other Cordoba's I'd slightly recommend are the Cordoba 45FM or FP. They are the same guitar, one just has snazzy peg tuners instead of geared. I believe these models were originally built in Spain, but I cannot 100% verify that since Cordoba started manufacturing in China. .I'm an old guy who decided to take up acoustic guitar when I retired. It ain't easy! After playing a 1928 Martin concert guitar (belonged to my mother-in-law) I realized the differnce between how great a good guitar sounds (as opposed to the $100 one I was using) even if you're a beginner. Soo - bought a Martin steel string that sounded pretty good and have spent 5 years of casually learning how to play.Tried a friend's inexpensive nylon string and learned it was much easier on my fingers and although it sound clunky it was warmer than my Martin steel. So after lot of looking, reading and trying, I bought the Cordoba Gypsy King and can't believe how much better I sound and how much easier it plays. 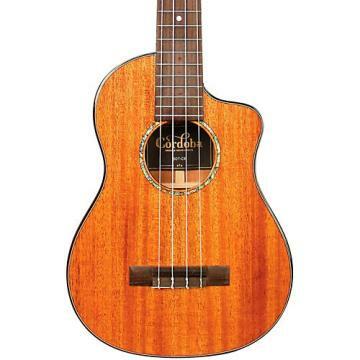 It feels warm and friendly in my arms and plays with much more volume and dynamics than the steel string. It sounds better than any other nylon string I've tried and I did try several, some well over 3 times the price of the Cordoba GK.If you're an advanced beginner or beginning intermediate player you can't go wrong with this guitar. I strongly suggest you install Savarez Corum strings (JEU/SET 500AJ) strings in place of the mgr's installed Savarez which have very loud base strings which overwhelm the high string (good if you are actually a serious Flamenco guitar buff, I guess). The Savaez are a bit pricey, but sound great and seem to last longer than others I've tried.ps. You advanced guitarist should check this one out - - - you'll be glad you did - - - a lot of great sound and playability(?) for the money. .I was not impressed by the Cordoba GK Studio. The sound is just OK not bad but I heard cheaper guitars that sounded better in my 35 plus years I've been in the business. The electronics are good except the microphone. The microphone is not of the goose neck kind which you can move around inside the sound hole. Instead, it is affixed to the plastic housing of the preamp next to the battery compartment. The microphone picks every bit of sound produced by your hands while playing and also every minimal contact with the guitar. What a bad design.I always thought Cordoba guitars were one of the best in quality and craftsmanship but that's in the past. After a month of use, my guitar's top was bulged after the bridge but it was still playable. I think the top is way too thin. I checked the braces and they were glued (by the way inside the guitar looked flawless. Humidity in my house is always kept around 40%-45%. I went back to the music store, returned it and got another guitar (different maker) which was a bit cheaper but sounds a lot better.Maybe the Cordoba GK in my case was just 1 defective guitar out of 10,000 guitars produced without defects. But for me, one was too many. .Purchased this guitar at a local GC after an exhaustive search for a flamenco acoustic/electric that suited my needs.First off, it is very difficult to find an instrument that fits the description "flamenco acoustic/electric." Furthermore, I was seeking an instrument that included mic/piezo blend capability. Only several instruments to my knowledge fit this description: The Cordoba GK Studio, Cordoba 55FCE and the Yamaha CGX171SFC. I had a bad experience with the Cordoba 55FCE and it ended up going back to the store (intonation problems due to neck warpage/lack of truss rod). Yamaha is a homerun hitter when it comes to quality and value, but they have discontinued the model I mentioned above in favor of their new NX line (very cool, btw) but which do not have internal microphones, which left me with the GK Studio.The GK Studio is built extremely well, but with cheaper materials, so as an acoustic instrument, it's overall sound is very intimate and doesn't project very well. However, I find the tone to be very pleasant, nonetheless.For me, the value in the instrument lies in the electronics, which features an internal mic/piezo blend feature and sounds AMAZING amplified. For my money it's superior sounding to any other instrument that is limited solely to piezo sound when amplified.Low, flamenco-style string action and a slightly narrower neck (50mm as opposed to standard 52mm for nylon strings) make for supreme ease of playability. Body depth is shallower than normal. Also, peace of mind thanks to the inclusion of a truss rod.Add to that a gig bag and a very reasonable price tag and you've got yourself a solid buy. I enjoy playing this guitar very much. Recommended. .I always wanted a flamenco guitar but they were too expensive without a preamp. The GK Studio was the solution of my needs since it has the flamenco tone and I can amplify it very easy obtaining a natural acoustic sound. The most I like from this guitar is how it sounds. I play nylon guitar in the church and the GK Studios sound cut among the others nylon (classical) guitars without increasing the volume in the preamp. Also, I like to use it when practicing anything acoustic. The neck is very comfortable, the bar chords in higher frets are effortless. The intonation is excellent. Other musicians were impressed with my new guitar. After five weeks, I noticed a little increment in the action height. The Cordoba personnel advised me to adjust the truss rod, since it is normal for the guitar to experience slight changes as it experiences different climates. I was feeling uncomfortable in making this adjustment but anyways the Custom Guitars Friend personnel bring me an excellent service and exchanged it by a new guitar. I received the new guitar and I feel very happy since it is the same consistence in materials, details and the sound, only the time will tell if the new guitar will need further neck adjustment. The guitar is light weight and feels solid when you are playing strums. I recommend this guitar. .Hard to beat for 500 bucks. Sounds great, plays great, looks great, what else do you need? I have to give this guitar 10's because I got a great deal on it (499) brand new, right out of the box. Sounds and plays great. Sounds great through an amp as well. I'll give it an 8 here since it is made in china. overall quality is good though, but I bought it for the sound and playbility more than anything. I actually wanted the model made in Spain, but the crappy guitar center near me didnt have it! They only had 2 electric nylon guitars there that were over the price 599, and neither of them sounded as good as this one. One of them was a Taylor, and I still liked the sound of this over that one. I figured I'd leave it for some smuck who wants to say " I got a Taylor". Nice guitars, don't get me wrong, but I like to play, not pay...I did look at a yamaha that was a little cheaper, and looked like a more quality built guitar, but the neck was too thin, and the sound was not as bright as this one. gotta give a 10 here again, for the money, it was the best sounding electric nylon type guitar in the place. .I have been playing guitar for about 25 years but never owned a nylon string. I finally purchased this one about 3 months ago based on reviews and some time with the guitar at a local GC. Overall I am very impressed. The guitar is addictive to play and I love the tone. The builtin tuner is accurate. I have not used the builtin microphone, but the guitar does record nicely with a condensor mic. 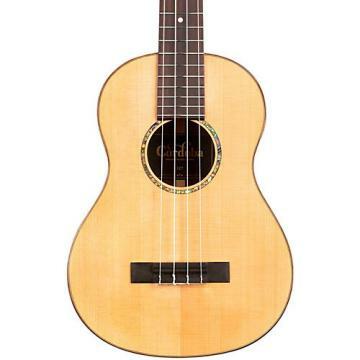 I would definitely recommend this guitar to anyone considering a first time purchase of a nylon string guitar especially considering that the price is quite reasonable. .This is a fabulous guitar for the price, plus the gig-bag, and playing it has inspired me to push ahead trying new rhythms and strumming techniques - I'm having fun and loving it !! The cut-away and translucent varnish make this one good looking flamenco guitar, and the smaller than average size neck make playing a pleasure (particularly if you have relatively narrow fingers, as I do) The Fishman, with built in digital tuner, is great and really useful with nylon strings that tend to go out of tune in our dry heat over here. The relatively light weight gives the GK Studio an easy play feel and the tonal quality is excellent. You have to adjust to the lighter playing style demanded of a flemenco guitar, but you can really strum away with wonderful effect. Can't fault the overall quality - time will tell, but the GK Studio is a thing of beauty ! Love the overall feel of the GK Studio and it's ease of playing. .Many years ago I used to play classical guitar. I picked this up to get back into classical. The tone is the fantastic. The cut-away makes reaching higher frets much easier. The mic also has a tuner which is great. It takes a 9v battery. The guitar sounds great through an amp too. 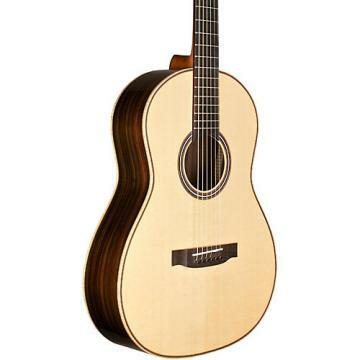 .as a student of flamenco guitar i found this cordoba among the finest to play flamenco. in 25 years i have never played a true guitar with the finest action, tension, and sound. tis guitar has helped me sound better in flamenco by projecting the music and not only fast flurry runs. I was passionate to know that the GK studio was a guitar that became an extension to yourself. it is a great perfomance guitar as well for recording. the build is excellent and the sound drives you to play your best, not as a fast and flurry player, but a romantic passionate artist. try this and you'll see why the gipsy kings use this. not only is this a good working guitar, but it is a cost saving investment. you don't need to be a flamenco player to own this, any style can be copped from this. believe me! buy this and you'll see how excellent this is.